This Ganesh Chaturthi go eco-friendly and wish your loved ones! Ganesh Chaturthi has already begun. The lord of wisdom and happy beginnings is worshipped all over India during Ganesh Chaturthi. But, this festival is hugely celebrated especially in Maharashtra where almost every household brings home a Ganesh idol during this festival. The idol is worshipped for ten days and the festival culminates on the day of Anantha Chaturdashi when the idol is finally taken and immersed in river waters. How to grow a Bonsai tree in your home We have already learned about doing a rooftop garden in the previous post. Now, what if you want to bring the plants indoors! Plants and the greenery around can bring about a lively feeling in any corner of your home. And when added by a breeze they soothe you so much so that you can get transported to your good old days. Such is the magical power of plants. Moreover having plants indoor is very much in trend these days. Adding to that if you want to have a bonsai, that's just like adding a feather to your garden. Haha, Bonsai is an art that has been studied for years but you don't have to fret much as I bring to you a tutorial now how to grow a Bonsai in your home. The fervour is up...what are your plans? I just came from marketplace, it was all loaded with frills and embellishments!! Well, it had to. With Janamashtmi being around the corner you cannot expect anything less. We all Indians know that this is a great day as it marks the birth anniversary of Lord Krishna. So besides jhaanki, we also make various sweets along with panchamrat to add to the festivity. With all this being done, what remains most important is Jhula!, yep you heard me right, the swing on which our dearest of dear Krishna sits. The Jhula has to be an ostentatious one. So today I have come up with a DIY to do a Jhula which will make it no less than a newly bought one. 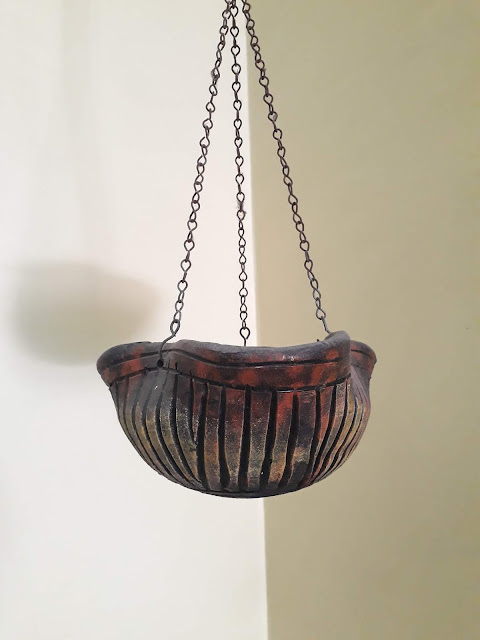 From Planter to a Hanging Diya! A DIY! This festive season let every corner of your home shine bright! Heyya, howz everyone doin? The festive season is around the corner with Janmashtami being next in the queue. It's the time when we all prep up our homes as there are fun-filled laughs, a game of cards, nudgings for one more piece of sweet, traditional pooja ceremony and positivity galore coming up! I love doing the decor at my place by rearranging the same old things or by innovating something new from something already there. Though I do not mean I don't like new stuff but the motto here is to budget money. So, today I have come up with a DIY which is to light up diyas in an untraditional way with negligible money involved! Confused where to place diyas so instead hang them! 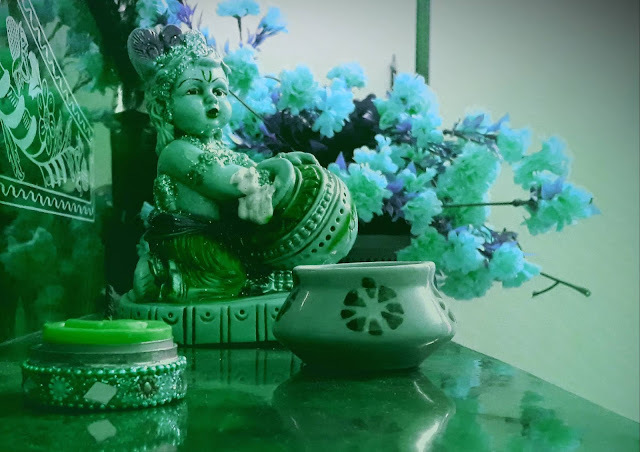 I changed a planter to a glittering diya holder... yea, this idea is so me! Vintage style usually refers to the style of a previous era. I personally like this style because it transports you to a completely different yet soulful world. It carries you back to your grandma's memory. This distinctive style is characterised by minimal, curvy shapes and muted colors. It can add fun touch to any design. It involves those pastel shades of white, antique decors featuring gramophones, old typewriters, bone china with floral prints, rustic doors, curvy detailing across furnitures and anything and everything that makes you remember for your grandma's days. This decor style has always been popular and is not just restricted to homes. Many commercial outlets like cafes, restaurants, shoppes etc adopt vintage styling for their interiors. We have already discussed minimalism and maximalism in previous posts. So now we head on to decorating our home with this old-fashioned yet bold look. Today I am going to introduce you to the two very different yet common decor styles. One is minimalism while other is Maximalist! Minimal involves neutral tones with only minimal furnishing involved in it.People who want a soothing taste for their interior decor can go with the minimal syle. On the other hand maximalism style involves a lot of vibrancy, drama and funkiness. Those looking for perkiness should opt maximalism.